Spent my 2 days here! Lovely place, very friendly staff and patrons alike! I Sat in the same place (upstairs, closest to the window) both days and just throughly enjoyed myself. First strain was the banana kush, didn't really taste much like banana to this casual smoker but it was certainly very relaxing and a really nice high. Would absolutely recommend this place and a special thank you to Fredrick! Het Ballonnetje for the fooking win, found half a g of Raspberry Cough that had hid itself in our bag's lining... Still had decent flavor and packed a serious punch after about three months forgotten in a baggie! Het Ballonnetje is the most trustworthy place to get top shelf weed IOHO, and Roger,Freddy and the rest of the staff are champs! New menu for het Ballonnetje dated December 7, 2017. Thanks to Dreaminjection. Bless you FBN, and Dreaminjection. Went here for the first time recently. Found the staff really friendly and helpful, more than happy to give you a run down on the strains and seemed genuinely interested in making sure you had a nice experience. Got the G13, smoked half and vaped the other half, as OneHighMofo had recommended it for vaping. Really nice taste vaping, would defo short list is a great strain to vape. The Ballonnetje is definitely my favourite coffee in Amsterdam. It's very nice to chill, to work, or to come with friends. The staff is always friendly with me, and I am never disappointed with their weeds (except for the Tangie, but it is just personnal taste, I tried in several places and just don't like it, don't know why, makes me sad :p). Special mention for the Amazon Kush, loved it Not the cheapest in the city, but very nice for me And the neighborhood is also pretty cool, even with the university next to it, it is always easy to find places to sit and it is quiet! Now that is latte art! Mr Nice G13 2 grams. Solid as always. MK Ultra 3 grams. Real nice heavy heady stone. 5grams limit reached sadly. Sat with a tea rolled and vaped for a while. Nice and chilled on the stools along the front window. Great little place. 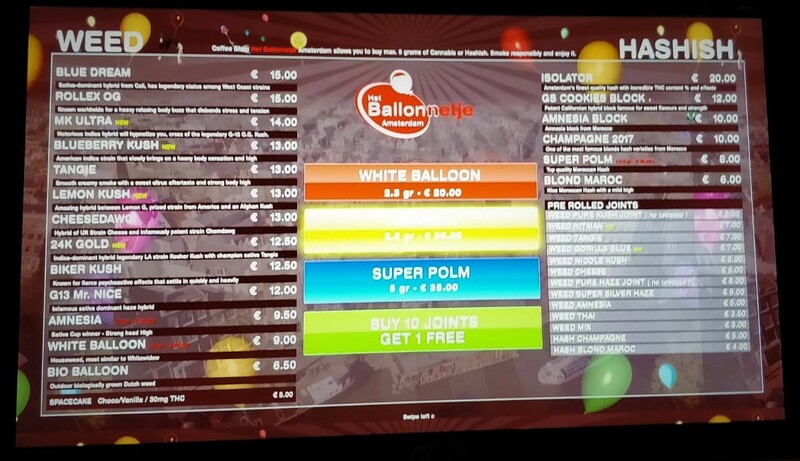 New menu for Het Ballonetje dated March 18, 2018. Thanks Choppermike. This place is definitely on the to do list. Honest and informed bud tenders will always get my vote as opposed to those who just want to shift their stocks regardless. It's a great menu as ever - especially considering the prices! 24K at €12.50??? I'd expect to pay 15/16 at Utopia/Easy Times etc. Karma Genetics Biker Kush for the same money??? One of the trendier kush crossses available and at a reasonable price too. I'd expect to pay 15/16/17/18 for 'current kush crosses' elsewhere. I'll be working my way through their entire menu over 4/20 for sure. Sadly not mon Ami, just my personal shopper picking up some tasters for Daddy when he arrives. See you soon Sir, weather improving and it's all looking great for April. Let the excitement build. Hahaha oh the perks! Excitement? Roger that buddy. Ten-four. Figured I would get the papaya too. 12.50 i think. The guys next to me got the same thing. Nugs were looking fresh and shiny with thc. More green and not fully dried but not wet either. Perfectly spongy. Good tropical flavor with some earthiness. Hits clean and smooth with nice relaxing head high. The 2 budtenders were very friendly as well. Great place.